In the midst of one of the best seasons in NHL history, the Tampa Bay Lightning have decided to lock up their head coach to a longterm deal before his value gets too high due to a potential deep playoff run. 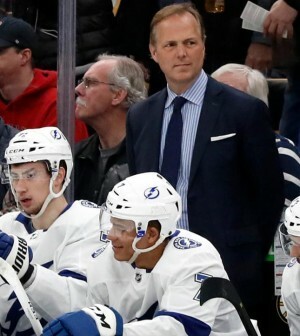 The team announced Tuesday that they have signed Jon Cooper to a multiyear contract extension, putting an end to speculation that he would reach unrestricted free agency and test the market in the offseason. “I am very pleased to announce Jon’s extension today…His ability to forge impactful relationships with everyone from players to staff has been a trademark of his tenure with the organization and he is the absolute best coach for our hockey team.” said Lightning general manager Julien BriseBois. The 51-year old, who is currently the longest tenured NHL head coach, is in his seventh season with the franchise since replacing Guy Boucher midway through the 2012/13 season on March 25, 2013. If the Lightning are able to live up to expectations this postseason, they will end their 15-year drought and take home the Stanley Cup for the first time since the John Tortorella, Vincent Lecavalier, and Marty St.Louis days in 2004.